Colm Collins has also been ratified as manager of the county’s senior footballers. ALL-IRELAND HURLING winning manager Davy Fitzgerald will continue in his role with Clare for an additional three years. The legendary goalkeeper, contracted for another year with his county, had opted to stay quiet and think about his own future in the immediate aftermath of Clare’s comprehensive SHC final replay victory over Cork last month. This evening, The Banner can rest easy with the Sixmilebridge man now in place until 2017 for the next step with his young team. Clare GAA tweeted the news this evening after a meeting with the county board which also brought the ratification of Colm Collins (father of Podge and Sean) along with as senior football manager as replacement for Mick O’Dwyer. Collins’ fellow ex-senior footballer Ger Keane will stay on as selector. Is the Clare hurling championship set to be deferred? 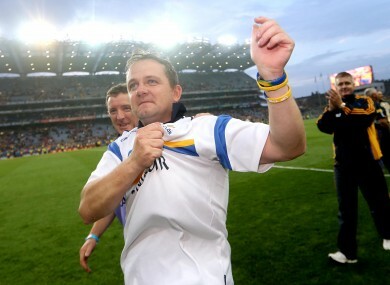 Email “Davy Fitz set for 3 more years as Clare hurling boss”. Feedback on “Davy Fitz set for 3 more years as Clare hurling boss”.